March 29-30, 2019 at the Red Lodge Elks hall, 114 Broadway Ave N, Red Lodge, Montana. Dance instruction by Bob and Maren Holmen, music by Vidar Skrede and Fargo Spelemannslag. Organized by Billings Leikarring and the Scandinavian Dancers of Red Lodge. Look for updates on the latter group’s Facebook page, https://www.facebook.com/ScandiRL. 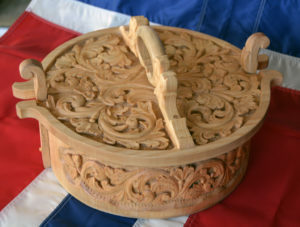 As an additional incentive to participate in the 2019 workshop, master woodcarver Greg has donated a tine box for a drawing. Greg estimates it took about 200 hours to make. Persons registered for the full workshop, including the banquet, will receive two tickets. Persons registered for just the workshop session or just the banquet will receive one ticket. Drawing will be held during the Saturday evening banquet. 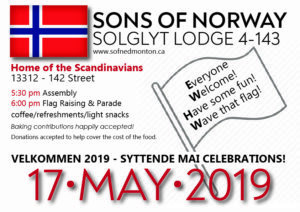 June 7-9, 2019 in Meota, SK. Depending on participants’ interests and the weather, bowling, golfing, cards, and games are being planned. Maybe a pontoon boat ride too. Lots of accommodation choices in nearby North Battleford. Camping and B&B possibilities on Jackfish Lake. More information will appear here as it becomes available. With Mikkel Thompson and Ginny Lee at Festival Hall in Red Deer, October 4-6, 2019. Hosted by the Fanatullen Scandinavian Dancers (look for them on Facebook). Do you have a cultural skill you are willing to share? Contact your zone director or Cultural Director Martha Elliott (martha1946@hotmail.com) to be added to the database. Click Expert Database.rev for the current list.